When I moved into my new house last year, after losing 50% of my kitchenware, my mother was nice enough to buy me a crock pot. My original intentions were to use it to heat up rum and cider and I was never sure if I'd find a good use for it to make food. In some families, crock pot cooking is the norm, but my mom never got down with crock pot cooking when I was growing up. The idea of putting food in a pot and letting it cook all day seemed odd to me. But after my boyfriend recently grumbled about how long it takes to cook on weeknights, I decided to buy The Vegan Slow Cooker by Kathy Hester. I'm generally hesitant about buying cookbooks sight unseen, but after reading reviews for the cookbook, it seemed like it would have some fairly simple recipes that we could try out. And by "we" I mean my boyfriend. I had every intention of making this vegan pumpkin lasagna myself. But...I basically just ended up just getting spices out of the cupboard. Not sure how that happened exactly, but if someone wants to make you dinner - don't turn them down. Make the pumpkin tofu ricotta. Blend all ingredients until creamy. Prepare the crock pot. Spray with cooking oil or grease the pot to prevent the sauce from burning/sticking to the sides. Spread a think layer of pasta sauce on the bottom of the crock pot. 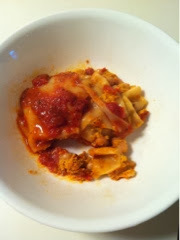 Break off the corners of a lasagna noodle and place it on top of the sauce. (to make use of the whole crock pot, break other noodles to fill in the rest of the pot). Place a single layer of noodles over the sauce. Spread a thin layer of sauce over the pumpkin ricotta mix. Spread 1/3 of the beans over the sauce. Repeat the layers two more times and end with noodles on top. Top noodles with remaining pasta sauce. Cook on low for 3 to 4 hours or on high for 1 1/2 to 2 hours. So how did it turn out? Because I went for a longer run than I'd originally planned (oops) the noodles got a little overcooked. But...the lasagna still ended up being really good. There was a very subtle pumpkin flavor. Otherwise, it tasted like good old lasagna. (and my boyfriend tells me the lasagna is better reheated - he had the leftovers for lunch yesterday) I wasn't the biggest fan of the beans, but...they added protein. And my boyfriend liked them, so...maybe we'd include them when we make this recipe again. If using tofu in a recipe weirds you out, this recipe could be easily vegetarian-ized. You'd just swap tofu for ricotta cheese and omit the nutritional yeast. I'm sure it would be just as good. Overall, I'd say this was a cooking WIN. Not just because I didn't have to lift a finger, but because this was a super easy meal to make and it was a really interesting way to use pumpkin. Let me know if you give this recipe a try! And if you're looking for quick and easy recipes to try out in your crock pot, pick up The Vegan Slow Cooker! Thanks for your share this tip for do the good food and that look interesting. I will try at my home. So how did it turn out? Because I went for a longer run than I'd originally planned (oops) the noodles got a little overcooked.